TMRpcm music; //Lib object is named "music"
Just curious what speaker you are using for this project? It sounds very nice. This is a normal 8 ohm speaker. There is nothing special with the speaker, because I have tried it with other speakers and was able to achive the same qulaity. The part list says you need a 10uF and 100uF capacitor but the diagram shows 1uF and 10uF in the circuit....which is the correct combination? I have tested the circuit will both the combinations and they worked fine. You can use either one and the performance will be the same. So I use the 100uF instead of the 10uF and the 10uF in stead of the 1uF? hey, I see in your fritzing pic you put the ground in the + line and the + in the ground line, but the speaker's black wire is connected to the breadbard's blue line (where is connected 5V) and the red wire to the red line (where is connected gnd). Where should I connect amplifier pins? Yes the firtzing pic has a small representation problem. But, the connections are correct and will work as expected. I have mistakenly swapped the positive and ground rails (representation) of the breadboard with the actual positive and ground rails of the circuit. This will not be a problem since the logic of the connection remais the same. but the speaker's black wire is connected to the breadbard's blue line (where is connected 5V) and the red wire to the red line (where is connected gnd). No, You have completely misunderstood the circuit. The upper positive and ground rails are only powered by +5V and ground. The lower potive and ground rails have not other connection other than the speaker itself. Sketch uses 12676 bytes (39%) of program storage space. Maximum is 32256 bytes. Global variables use 1118 bytes (54%) of dynamic memory, leaving 930 bytes for local variables. Maximum is 2048 bytes. Hi Miles, The above problem is not because of the program but because of your PORT settings. As the error states "can't open device "COM1": No such file or directory" Meaning you have either not selected the correct COM port or have not connected Arduino to PC properly. Try uploading a Blink program to verify your settings before trying this program. Thanks! I have the same problem ,, have you solved it?? Hey!! can you please update this project with arduino mega board without the buttons which you've used in this circuit.Also if I removed the buttons is it possible to play multiple files ? Will this work without the LM386 and go direct to head phones? Is it related to Module vendor ? So you have a 3.3V module with 5V level shifter right? Make sure the level shifter is working by manually measuirng voltage. What error did you get rami? Error compiling for board Arduino NG or older." Has anyone tried playing the wav clip stored in onboard flash, without the sd card? Hi, I am looking to build something like this, but with an option to play one of four .wav files. Is it fairly simple to instead have four buttons to play an audio track, and another to stop. Pressing of any button halting any other .wav file and playing just the programmed .wav file? Sir, Will you please give me a sample coding for arduino program to play the audio files one by one at exact pre- scheduled time interval and switch off as the song ends. hi i think ive wired everything correctly but no sound is coming out except an occasional tap? and my lm386 chip is getting really hot. im trying to make it so that i can move the buttons off away from the breadboard if possible. ok final update before my head explodes! something along the lines of making the song files constants? could this be why my files wont play? How would you connect a speaker using bluetooth module HC06? I am unsure of how to do this. Hi. How is it possible to for arduino to give smooth analog signal for music since it can only produce pwm? Can you answer me please. I am confused. This produces analog signal to play music. You have dive deep into how the library works to understand how the signal is produced. I was successful in doing the same. However, everytime i press the buttton to play the music i can a loud ticking sound in which i believed coming from the switch. Is there anyway i can eliminate this "click" sound. No i don't think you will need amplification for Headphones. Let me know how it turns out ! Not play properly in the sense? Are you getting wired sounds? or is it just mute? You can use any speaker, you can also use your computer speakers. the memory card is ok and formatted also. The code has a "}" in the wrong place. Move the second to last "}" above the line "if (digitalRead(3)==LOW && debounce2 == true) //Button 2 Pressed"
Can you specify where the error is in the fritzing diagram? I am trying to build this circuit based off the fritzing, but earlier comments make is seem like the fritzing is inaccurate. It plays only noise .No playback.what can be the error?? Hi, thanks for posting this project. I have a question. What's the purpose of putting a 10k resistor in series with a 10uF capacitor to ground at the output? Usually a low resistance (10ohm) and low capacitance (0.05uF) are used in that manner to filter out high frequencies. I think that way you filter out also desired frequencies. Let me know please. Thank you. Can you please CLEARLY specify where the errors are in the breadboard diagram? I am having trouble building the circuit and would like to use the breadboard diagram instead of the schematic. Are there any errors in the schematic, or can I build safely off of that? You have done a very good job. I am also doing a project like this. I want to add one more button for stopping the music. I tried with the "audio.stopPlayback(); " function . But is not working properly. Do have any idea how to fix this? Say, in your current project if you add one more button then what will be the code for stopping the music? Which code and circuit are you using? I used the one given here and dint find any problem? What error are you facing? What do you mean by failing to initialise? I connected everything and put code on arduino but it doesnt play the music. You can just hear some noise, buttons do nothing, Whats the problem? song_number=1". And no any sound is heard. Can u plz help us out wdt this issue. We have replaced the amplifier circuit with the lm386 module directly. Can you please share the pin connection diagram. Because yet we are getting the same message. Yes you can also use a lm358 in place of lm386. The circuit will vary a bit, google for LM358 amplifier circuits and you will get one. 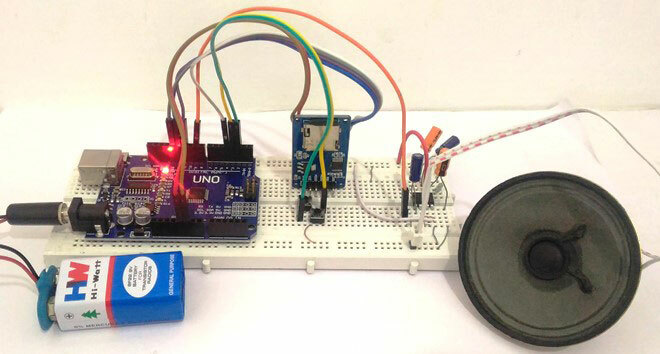 How much Arduino microcontroller memory does this project use? Mr Raj, Thank you very much for this project. I found this is very useful and cost saving (no buying mp3 shield), I will build mini music player for my kids. Hey, thanks a lot for the project! However, I am having trouble when the music starts playing, sometimes songs just start fast forwarding alone and skipping parts. Also the the code just stops sometimes when the skipping gets really bad. Is this a problem with the wires? or the sampling of my wav files? Hi! Can I use a PAM8403 to amplify the sound? hello, i just want to us if it is possible to control the speed of the stepper motor using the music mp3 plays? and how if it is possible, i need that on our project, i just want to know if it is possible because our professor want our project music box to control the rotation of the balerina through the beat of music, for example the music is upbeat therefore the balerina rotates fast and if the music is slow, the balerina rotates slowly. Thank you. I want to attach HC05 Bluetooth to control song & servo with mobile. So what is code?? Hi, can you tell me how to increase the volume through hardware.can i do it either by changing capacitors or increase power to the circuit or any other ways you know? thanks! can i use LM358/LM741 instead of LM386? I did everything on this page my professor checked it and said its good but when i power it on nothing happens. Not everyone (even the experienced) gets a circuit to work in the first try. Learn to debug a circuit when you don't get an output, this is an important skill in electronics. So break the circuit into smaller parts and check where the output is messing up. what are the alternative capacitors i can use for 1uF 25v capacitor? hey my friend, anyone have bips sounds? when um push the bottom i have only the bips. Hi, its not entirely clear to me regarding the connections to the push buttons. Do both buttons have a connection to GND and then to the pins 2 and 3 respectively? So the idea is that pulling those pins to GND will trigger the appropriate function?